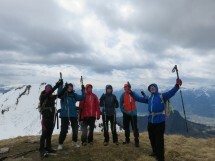 This Sunday, April 16, I organize a hike in Mieussy. Distances from Geneva 30 km. After the cave of the Jourdy, the trail rises in the forest, alongside steep slopes. Then the entire hike is uncovered. We go on a ridge path to the top. Panorama over the valleys of Giffre and Arve. Back by a medieval way and the chapel Saint Gras. A gradient of 1075 m and a distance of 12 km. Walking time: about 5 hours. Price 5 Euros including insurance. Transport: passenger pays 6 Euros to the driver.